Make the most of your time in San Jose and save with this package combining two favorite experiences. 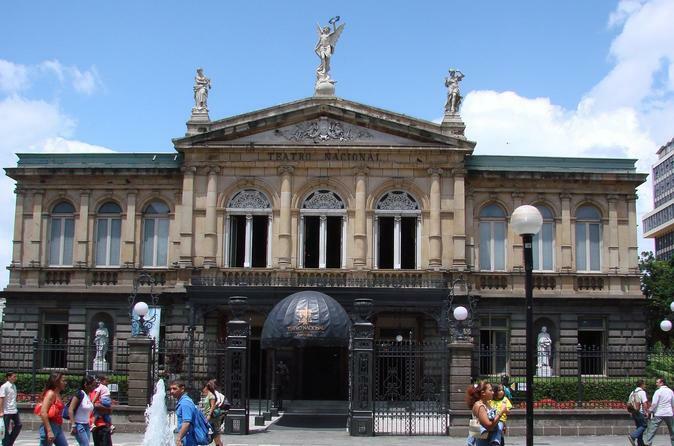 Get a great orientation to the city’s top attractions with a guided bus tour that also includes entry into the opulent National Theater and Pre-Columbian Gold Museum. At night, dine at a restaurant with spectacular views of the city lights as you enjoy a performance of traditional Costa Rican music and dance. Experience both tours in one day or spread them out over two to suit your schedule. Enjoy two popular San Jose tours at a discount when you book both through this super saver. For a wonderful orientation to the city, hop aboard a comfortable coach for a guided bus tour of San Jose’s highlights, plus entry into a pair of cultural attractions. Spend an enchanted evening at a popular restaurant located in the hills above San Jose. Take in views of the twinkling city lights below, and then dine on traditional Costa Rican cuisine as you watch a show of folkloric dance and music. You can opt to complete both tours in the same day, or spread them out over 2 days. Please note that the San Jose City Tour is available 7 days a week, while the Traditional Music and Dance Show is only available Wednesday and Thursday nights. Begin your sightseeing tour at La Sabana Metropolitan Park, Costa Rica’s largest urban green space, which locals call the ‘lungs’ of San Jose. Drive through the neighborhood of Rohrmoser, continuing along Paseo Colón on the way to the National Theater in the Plaza de la Cultura, where you'll take a tour. Stroll over to the Pre-Columbian Gold Museum, housed in an old military fort. Then, walk over to Plaza de la Democracia, built to commemorate the country’s independence, and board your bus again near the Supreme Court of Justice. Wrap up your tour with a stop at a diamond and emerald jewelry store, where you’ll learn how gold is processed. Sip a cup of coffee here and walk through the on-site gallery featuring work by well-known Costa Rican artists. Then depending on whether you’re taking the tours on one or two days, you’ll be transported to the restaurant for your traditional music and dance show, or back to your hotel. Please note: San Jose museums are closed on Mondays and the National Theater is closed on Sundays. After early evening hotel pickup (if you’re taking the tours on separate days), travel by comfortable coach into the hills surrounding San Jose and admire the sparkling lights of Costa Rica’s capital city below. Arrive at a spacious restaurant with large windows boasting panoramic views of the Central Valley. Take some time to meander about the attractive grounds and restaurant, bedecked with Costa Rican crafts and historical memorabilia. During your meal, watch a folkloric performance set to live marimba music. Women twirl in long colorful dresses alongside sharply dressed men, in traditional dances that have been passed down for generations. The show culminates in a masquerade extravaganza and then a display of fireworks. After this spectacular finale, board your transport back to your San Jose hotel.